Algebra 2 & Trigonometry on ! 5 DVDs · 10 hrs. From logarithmic equations to the law of cosines, Video Aided Instruction’s Algebra 2 & Trigonometry can help you make sense of second-year algebra and trig. 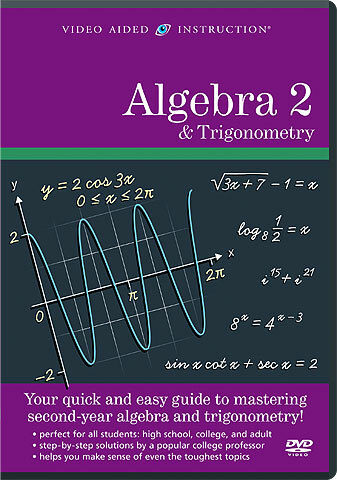 The ultimate resource for high school students through adult learners, this set covers the standard algebra and trigonometry topics taught in Algebra 2 and Intermediate Algebra classes and is jam-packed with hundreds of practice questions and strategies for tackling even the toughest problems.